"Steaming, succulent and savory. A robust and hearty classic that never goes out of style." In a Dutch oven, cook sausage and ground beef over medium heat until meat is cooked and browned; drain. Stir in onion, celery and garlic. Cook and stir until tender. Add tomatoes, beans, broth, tomato paste, sugar, chili powder, Worcestershire sauce, cumin and red pepper flakes. Bring to a boil; reduce heat, cover and simmer for 20 minutes, stirring occasionally. Serve with cheese, sour cream and onion. 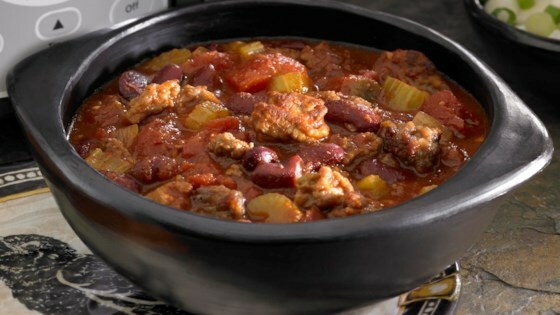 See how to make a classic chili. This was the best chili recipe I have tried in a long time. It was very hearty and had an awesome flavor. This will definitely be made again. Delicious! We made it without any Italian sausage or Worcestershire because we didnt have it on hand, and it was DELICIOUS! Love the flavor of the kidney beans and the tomatoes. YUM! So good! The perfect combination of ingredients. I added mini bow-tie pasta to it. I won a chili cookoff with this recipe last year and will be making it again this year! Just made this dish, recommend you cook it for 2.5 hours, then add the beans. Husband thought it was very good. Easy to make.